July 2-3 is the European Spreadsheet Risk Interest group annual conference - I hope to see some of you there! The next event for the Information Systems Security Association (ISSA) will be from 2 to 5pm on Wednesday June 10th and will be a special event in conjunction with Microsoft, focusing on the upcoming security enhancements in the Windows platform and Microsoft's security work in Dublin. The venue for this seminar is the Academy building at 42 Pearse Street, just around the corner from Pearse Street DART station. This event is free of charge and open to non-members, however registration is required at the URL above and in allocating places priority will be given to ISSA members. For any questions, group bookings, membership renewals, etc please email info-at-issaireland.org. (1) Even if you're outside the USA, it applies to you. Ignoring the settlement (the ostrich option) gives Google permission to digitize your books in the future and use them in accordance with the settlement. In this context, "opting out" means opting out of the settlement, it does NOT stop Google scanning your books. Why the Google settlement matters to you. Nearly every book published before January 5, 2009 is covered by the Google settlement agreement. Karlin Lillington writes "Samantha Holman, chief executive of the Irish Copyright Licensing Agency, notes that some Irish writers have even found their doctoral thesis listed on the Google settlement site and so she encourages anyone who has ever written anything to search under their name for any works. The settlement “is not the perfect solution by any means. But it is the solution being proposed,” she told authors. “You have to start reading your contracts carefully.” To others who questioned how the company could copy and make available copyright content, Google’s response was basically “so sue us”, Holman says." "To consider how bizarre this is, consider it in terms of music. Imagine if Apple had just started ripping CDs and converting them without permission into downloads for sale through iTunes. And imagine if a lawsuit brought by musicians and record companies resulted in Apple being given digital rights to all that music and to collecting and distributing revenue for it." The EU is commissioning a study on the effects of the settlement on European authors. "The German delegation to the European Council has submitted an "information note" at its most recent meeting. In it, it points out that many of the rights holders that have works that are being scanned by Google reside in the EU, and that European copyright law differs significantly from the US'. Most prominently, the German delegation argues that Google is citing a fair use exception to copyright claims in undertaking its digitization efforts; that exception doesn't exist in Germany and other EU member states. " The Department of Justice in the USA launched an antitrust investigation into the settlement, despite the deal's nonexclusive clauses. "The inquiry does not necessarily mean that the department will oppose the settlement, which is subject to a court review. But it suggests that some of the concerns raised by critics, who say the settlement would unfairly give Google an exclusive license to profit from millions of books, have resonated with the Justice Department." The settlement came after two years of disputes and negotiations between Google and the AAP. It involves Google shelling out $125 million to establish the Book Rights Registry, which would kill the existing class action lawsuit against Google for its book search. "If You Are A Book Author, Book Publisher Or Other Person Who Owns A Copyright In Books Or Other Writings, Your Rights May Be Affected By A Class Action Settlement Regarding Google’s Digitization Of Books And Other Writings. Attention Authors And Publishers Outside The United States: The Settlement May Affect Your Rights As Well. Please Read This Notice Carefully." Google has already digitized over seven million books, including millions of Books that are still in copyright in the United States. Google users can search Google’s “digital library” and view “snippets,” meaning several lines of text, from Books. You should assume that you own a U.S. copyright interest in your Book, unless you are certain that your Book was published in, and that you reside and are located in, one of the few countries that have not had or do not now have copyright relations with the United States. What happens to the books of authors and publishers who opt out of the settlement? If an author or publisher opts out of the Settlement, the terms of the Settlement will not apply to this author or publisher. This means that the author or publisher is retaining all rights to bring a legal action against Google, for digitizing and displaying the author’s or publisher’s books and Inserts, and against the Participating Libraries, if desired. It also means that the Settlement neither authorizes Google to make certain uses of these books and Inserts nor does it prohibit Google from doing so. The May 2009 meeting of SoftTest Ireland was addressed by John McArdle and Anne-Marie Charrett. His topic was "Professionalism in Testing"
Anne-Marie Charrett is a professional software tester and runs her own company Testing Times. Her topic was "Startups and Software Testing"
Since the commercial launch of 3G Radio Access Networks in the early part of this decade, the market has been demanding new and more complex features, with ever more demanding time to market requirements. This, combined with demands for continuous improvements in operational excellence, necessitates more efficient development practices. In order to maximise these development efficiencies, it is vital that improvements are also made in verification strategies.This presentation will provide a whistle-stop tour along a timeline from 2004 to today, detailing the challenges encountered in verification of new features, and how they were overcome by shifting verification strategies. Lessons learned and problems encountered will also be addressed. Two case studies will be presented which show how savings in test cost of 70% to 80% were achieved in verification of some features. Today software development has truly become a globally sourced commodity. In the context of Global Software Development (GSD) to date testing has been perceived as a well defined task that is relatively straightforward and lends itself to being outsourced or offshored. This talk demonstrates that testing in a GSD environment is not necessarily a straightforward activity. In reality it can be negatively impacted by all the factors associated with distributed software development. In this context practical solutions which can be utilised to address these important issues will be considered and discussed. Agile Projects – What’s Effective? Ian Lawthers, Centre for Software Engineering. Ian will give an overview of Agile Methods and explain how the Agile approach has been applied in software projects within a number of local companies. He will outline common problems and benefits when an organization implements the agile approach and how these problems can be overcome. The Daily Scrum - does it Work? Stewart Bourke, ABM Data Systems Ltd. ABM Data Systems implemented the daily scrum as part of project to re-architect one of their core products. As they moved from a legacy development environment to the .NET platform, they also took the opportunity to review our development practices. Part of this was the adoption of the daily scrum, and in this presentation they will present their experiences. Introducing an Agile Development Methodology (EVO) – James Cleere, Cylon Controls. James will speak on how Cylon Controls implemented Tom Gilb’s Evo method. Evo (Evolutionary Project Management) is an agile method that allows frequent project feedback that reflects the actual state of the project. He will also outline how an agile approach was integrated with an existing ISO 9001 Quality Management System. Being Agile – Dave Halpin, Centre for Software Engineering. Step inside the head of the Agile Expert with the revolutionary new CSE tool DesignOORama. DesignOORama author, Dave Halpin shows how the tool can be used to maintain and improve your team's agility. This was recently posted on the Excel-L list. "I am continuously losing range names in Excel 2007. I keep renaming single cell ranges (e.g. "Project1", "TimePeriod1") only to find the range name missing from the file a few minutes later. Has anyone found a fix or other way to work through this"
This sounds like a really bad problem for those modellers who depend heavily on the use of defined names to make their models robust. ScanXLS scans any given directory and below and obtains a list of all the .XL* files. You then select some or all of these, and it opens each one in turn read-only and reports on some file properties, attributes, the presence of unusual features or settings that may represent a risk or are prone to human error, the error checking statistics provided by Microsoft Excel, a list of other workbooks that it depends on through links, and a scoring on how 'problematic' it might be. SCANXLS can also compare two workbooks to check whether their formulas and/or values are identical. 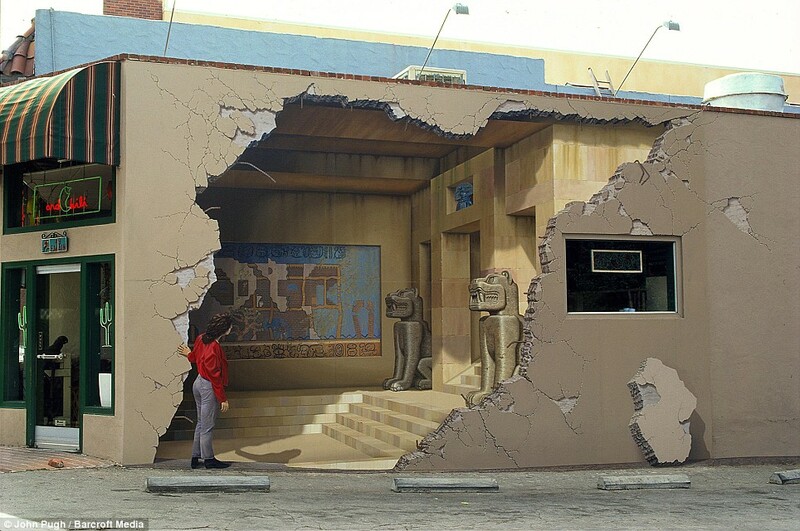 The paintings, which have fooled many, were created by John Pugh, who specialises in trompe l'oeil - or 'trick of the eye' - art. His works can been seen all over the world, including in the artist's home state. The 'earthquake' work shown here is located on Main Street in the town of Los Gatos and was created following a genuine earthquake in 1989. Copyright (c) Systems Modelling Limited, http://www.sysmod.com . Reproduction allowed provided this copyright notice is included. For those who would like to do more than receive the monthly newsletter, the EuroIS list makes it easy for you to discuss issues raised, to share experiences with the rest of the group, and to contribute files to a common user community pool independent of the sysmod.com web site. I moderate posts to the EuroIS list, to screen out inappropriate material. "Praxis" means model or example, from the Greek verb "to do". The name is chosen to reflect our focus on practical solutions to IS problems, avoiding hype. If you like acronyms, think of it as "Patrick's reports and analysis across Information Systems". Please tell a friend about this newsletter. We especially appreciate a link to www.sysmod.com from your web site! This newsletter is prepared in good faith and the information has been taken from observation and other sources believed to be reliable. Systems Modelling Ltd. (SML) does not represent expressly or by implication the accuracy, truthfulness or reliability of any information provided. It is a condition of use that users accept that SML has no liability for any errors, inaccuracies or omissions. The information is not intended to constitute legal or professional advice. You should consult a professional at Systems Modelling Ltd. directly for advice that is specifically tailored to your particular circumstances. We guarantee not to sell, trade or give your e-mail address to anyone.